On August 20th, Ottawa-based Grafoid Inc., a company involved in the research, development and production of graphene, opened a 225,000 square foot production facility in Kingston, Ontario. The move has Canada positioned to become a world leader in the production of the much-hyped super-material, with effects on many industries, not the least of which is aerospace. The facility, located in Queen's University's Innovation Park, in addition to housing research labs and graphene-related product development areas, will be the prime production point for Meso-Graf, a low-cost, high-purity graphene powder developed by Grafoid. The expansion into Kingston was facilitated by Grafoid's purchase of Kingston, ON based advanced materials group ALCERECO in June, 2014 for $1.25Mln USD ($36Mln CDN) as outlined in the June 9th, 2014 press release "Grafoid announces agreement to acquire advanced materials technology group ALCERECO Inc. of Kingston, Ontario." Through this acquisition, Grafoid gained access to ALCERECO's existing facilities, technical expertise and global customer base. Grafoid 's expansion into Kingston is expected to bring 160 new jobs and provide a $32.7Mln CDN stimulus to the local economy. Incorporated in September 2011 in Ottawa, ON, Grafoid is a graphene research and investment company. Its partners include Ottawa-based mining development firm Focus Graphite Inc. (the owners of a high-grade graphite deposit in Lac Knife, QC) and Singapore-based graphene producer Graphite Zero (a spin-off of the National University of Singapore's Graphene Research Center). 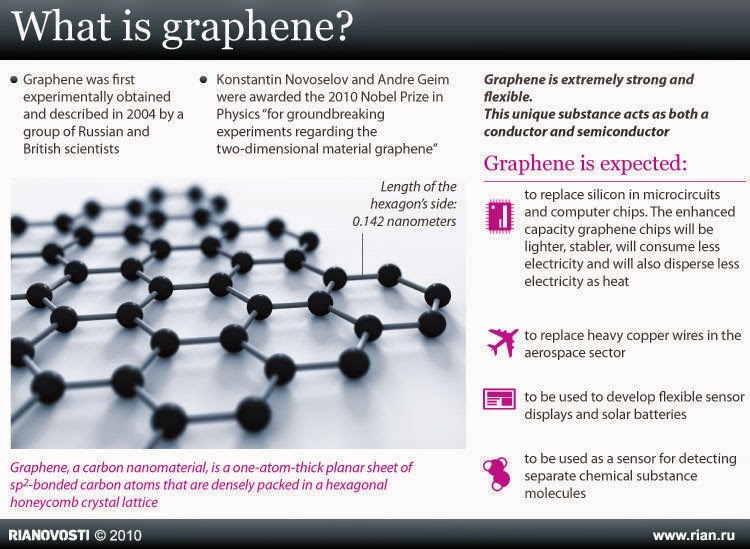 Graphene and its uses. Graphic c/o www.rian.ru. The company is pursuing the commercialization of graphene for applications in numerous fields including renewable energy, 3D printing/additive manufacturing, bio-medicine, specialized coatings and military uses. Grafoid is currently attempting to raise a further $50Mln CDN in capital for further product development, as well as for more acquisitions. Traditional methods of producing graphene are expensive, low-yield, multi-step processes involving harsh chemicals. Grafoid's proprietary production process (developed by company founder/ president & CTO Dr. Gordon Chiu) produces large yields of high-purity graphene from unprocessed graphite ore without the use of harsh chemicals. Chiu's method achieves higher yields by eliminating unnecessary steps from traditional processes and attains higher purity by eliminating harsh chemicals that typically damage the end product. A replacement for silicon in computer circuitry that would enable ultra-fast, Terahertz-speed optical computers and wireless networks. An aircraft building material even stronger and lighter than carbon fiber. Cheap, high-capacity batteries that could be charged within seconds. Filters that could cheaply desalinize seawater or remove radioactive waste. Cheap, compact, high-density hydrogen storage for use in transportation. For all of graphene's tantalizing potential, its development has been hampered by researchers' lack of understanding of the material as well the difficulties in manufacturing it economically in large quantities. The efforts of Grafoid and its partners will help mitigate both of these issues. In the coming years, graphene's promise may finally become reality.